Sudden Infant Death Syndrome: What the Numbers Mean to Me. I’ll confess, I was slow to be a strong supporter of the “Back to Sleep” public health campaign. The numbers seemed insignificant compared to other causes of death in children such as congenital anomalies, prematurity, and unintentional injury. Other reasons I was slow to become a cheerleader for the Back to Sleep campaign is that infants seemed to sleep less soundly on their backs and frankly, it wasn’t something I had personal experience with. I had worked with thousands of hospitalized infants in the 80’s and early 90’s, nearly all of them were placed to sleep prone or in a swing. Despite this, I had never experienced or heard of any cases of SIDS. With child care providers and programs I always encouraged safe sleep practices, but I was also sympathetic if a child caregiver provided what seemed to be a reasonable explanation for why the infant was sleeping in a swing or infant seat. But when the New York State child day care regulations were revised to include the following specific provisions, I knew I needed to further educate myself so that I could wholeheartedly promote the importance of safe sleep practices. 418-1.7(m) Children may not sleep or nap in car seats, baby swings, strollers, infant seats or bouncy seats unless otherwise prescribed by a health care provider. Should a child fall asleep in one of these devices, he or she must be moved to a crib/cot or other approved sleeping surface. (p) Sleeping arrangements for infants require that the infant be placed flat on his or her back to sleep, unless medical information from the child’s health care provider is presented to the program by the parent that shows that arrangement is inappropriate for that child. (q) Cribs, bassinets and other sleeping areas for infants must not have bumper pads, toys, large stuffed animals, heavy blankets, pillows, wedges or infant positioners unless medical information from the child’s health care provider is presented indicating otherwise. As a result, I reviewed the literature and the statistics are compelling. Sudden infant death syndrome (SIDS) rates declined considerably from 130.3 deaths per 100,000 live births in 1990 to 38.7 deaths per 100,000 live births in 2014. This occurred following public health efforts promoting safe sleep including a 1992 recommendation by the American Academy of Pediatrics and the 1994 ‘Back to Sleep’ campaign. As the use of prone sleeping position has decreased from about 70% to 20%, the incidence of SIDS has decreased by 40%. There are still modifiable risk factors to further reduce the rate of sudden unexpected infant death (SUID) which includes SIDS as well as unknown cause and accidental suffocation and strangulation in bed (ASSB). These modifiable risk factors include soft sleeping surface, maternal smoking during pregnancy, smoking in the presence of infants, and overheating. These and other modifiable risk factors led to a shift in the campaign name to Safe to Sleep to promote action that all caregivers can take to promote safe sleep environments for infants. Learning about SIDS and safe sleep is important for all caregivers including parents, grandparents, aunts, uncles, babysitters, and child care providers. There has been a significant reduction in the rates of SIDS as a result of the Back to Sleep recommendations and educational campaign, yet based on research findings of Moon, Patel, and Schaefer published in Pediatrics in 2000(1), SUID occurs at an alarming rate in child care settings, especially in the first day or week in care. The study found SIDS death rates of 20%, significantly higher than in the home with parents. Other findings of this study were that the infants were older, not black, and their mothers were well educated. These factors should categorize them as a low risk for SIDS. Many deaths were associated with prone sleeping position with infants either being placed to sleep prone or being found in that position. Mitchell et al (2) had previously found that a change in sleeping position, especially prone position for an infant accustomed to sleeping supine or side lying, greatly increased the infants risk of SIDS. This study also found that these infants were placed to sleep in the prone position by non-parental caregivers. The conclusion based on these two studies is that the infant is at the least risk for SIDS when placed on their back to sleep and at greatest risk when the infant usually sleeps on their back and is either placed on their tummy or rolls onto their tummy. Child Care Health Consultants can play an important role in promoting safe sleep environments for infants. We can monitor for safe sleep practices and environments when we visit child care programs. One deficiency I noticed in child care centers was the use of ill-fitting sheets supplied by the parent which could come loose and could bunch up while a child slept, especially in older infants who can change position independently. We can also help child care settings write and adopt written policies to promote safe sleep. Review of those policies should be required by all adult caregivers who enter a room where infant’s sleep including teachers, administrators, volunteers, and parents. The policy should include requiring a health care provider note to permit an infant to be placed to sleep in a position inconsistent with current safe sleep recommendations and NYS child day care regulations. The policy should also state that when a sleeping infant is dropped off by the parents that either the child care provider or the parent place the sleeping infant in their crib on their back. We can also provide education to child care providers about some of the possible unintended consequences of supine sleeping position; these include plagiocephaly (position related head and facial deformities), torticollis, and delayed early development. If adult caregivers are aware that an infant’s position can be altered while remaining supine, that infants need the opportunity to move freely including time on their tummy every day, and that routine developmental screening can detect early motor delays, then these issues can be prevented. 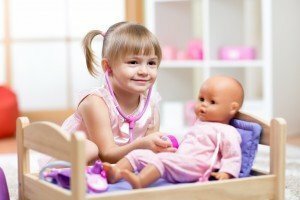 Child Care Health Consultants we can help child care providers to be confident that they are doing all they can to promote the safest sleep environment for infants in their care. 1) Moon RY, Patel KM, Shaefer SM. 2000 Sudden infant death syndrome in child care settings, Pediatrics 106: 295-300.